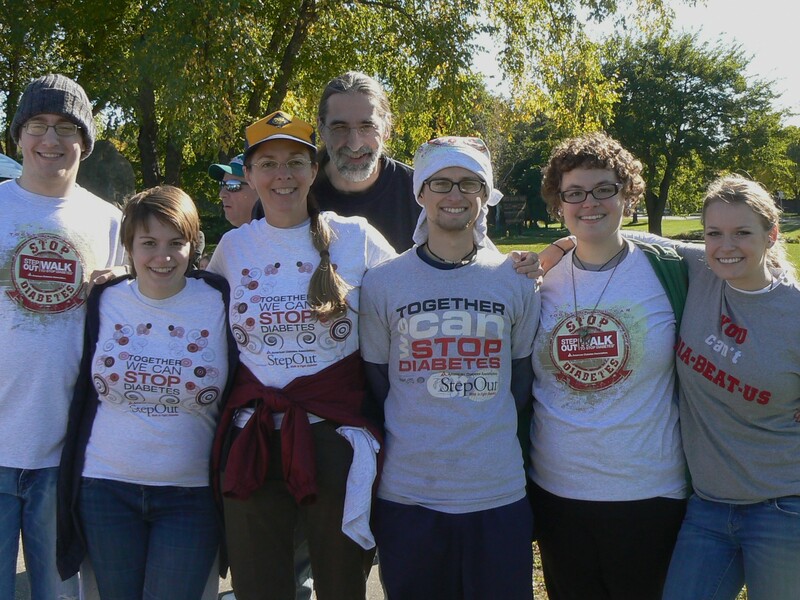 Last Saturday, I participated in a fundraising walk sponsored by the American Diabetes Association. My husband died from diabetes and related heart disease in 2008. 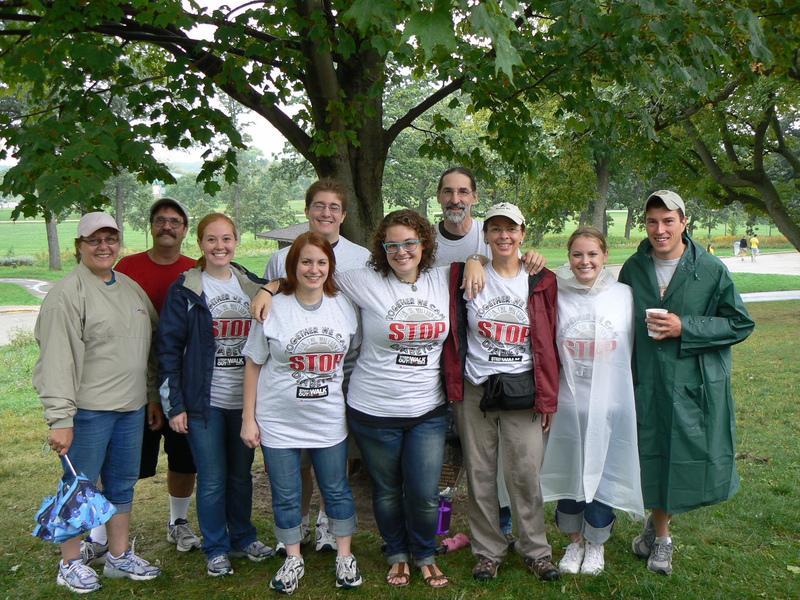 My oldest daughter was inspired to join the Step Out Walk in 2009 and invited the rest of the family to support her and the cause. 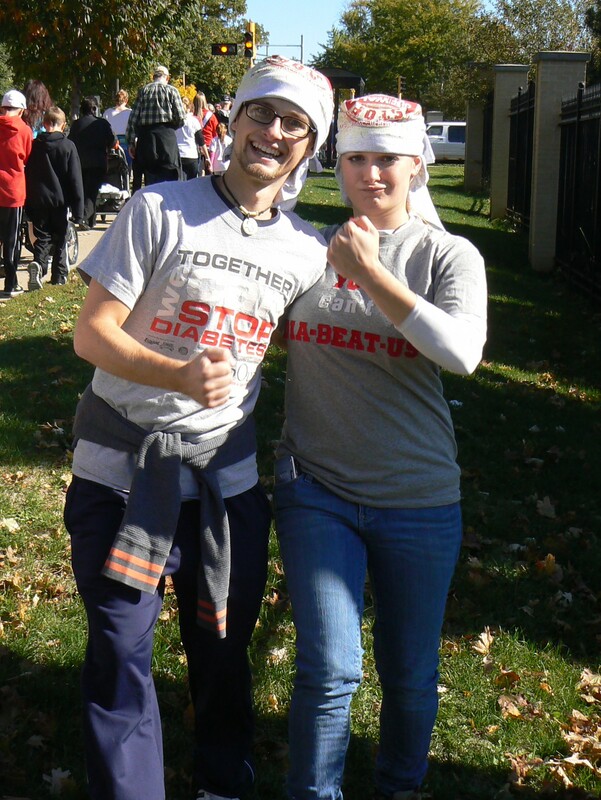 This year, she was diagnosed with Type 2 diabetes and thus became a Red Strider, not just a supporter, at the walk. I am proud to say that she is also making great strides in addressing her health issues and making real changes in her life habits. Here are some shots of “We’re walking….” that I took that day. The WordPress Daily Post sent me an interesting challenge: “For this special mid-week photo challenge, we want to see portraits of you doing something that inspires you to blog.” The challenge for me is that I am rarely in a photo, as I’m usually the one behind the camera! However, I found a selection of 5 photos that may serve this purpose. The theme of my blog is “Striving to live gracefully in my 50th year.” I began it on my 49th birthday, and its purpose was to give me a vehicle for sharing my journey toward maturity in writing and pictures. I find inspiration for growth all around me. These pictures illustrate just a few examples. 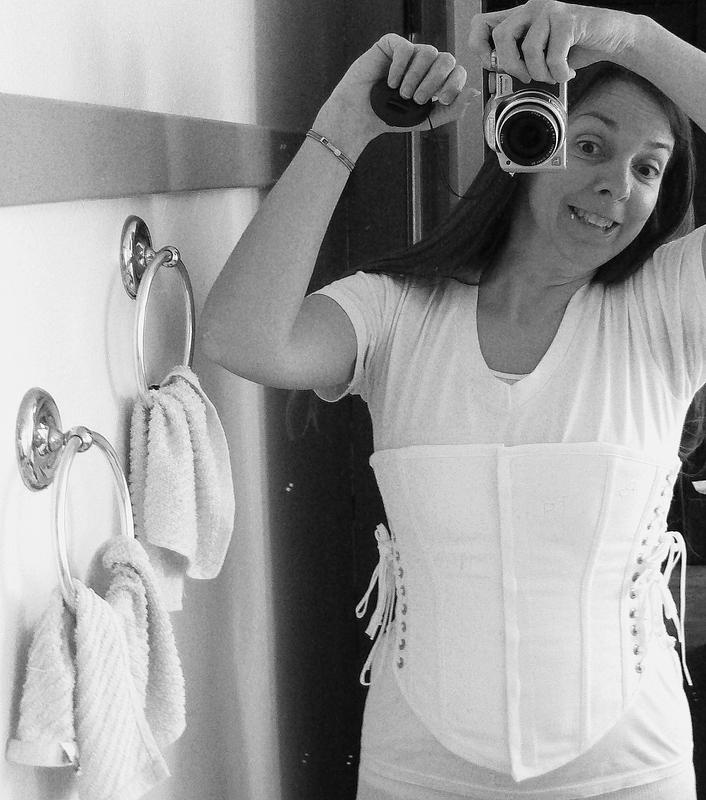 Here is a self-portrait of me wearing the corset that was part of my costume as a historic interpreter. That job inspired many posts about history, lifestyle, and preservation. 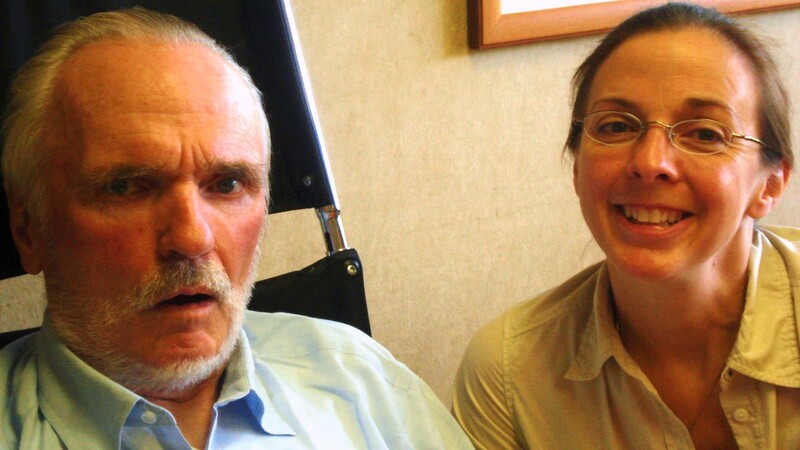 Here is a picture of me with my father before he died of Alzheimer’s disease. I have met others who are caring for a parent with dementia through this blog, and questions of facing mortality, change, loss and frustration with grace have inspired many posts and comments. 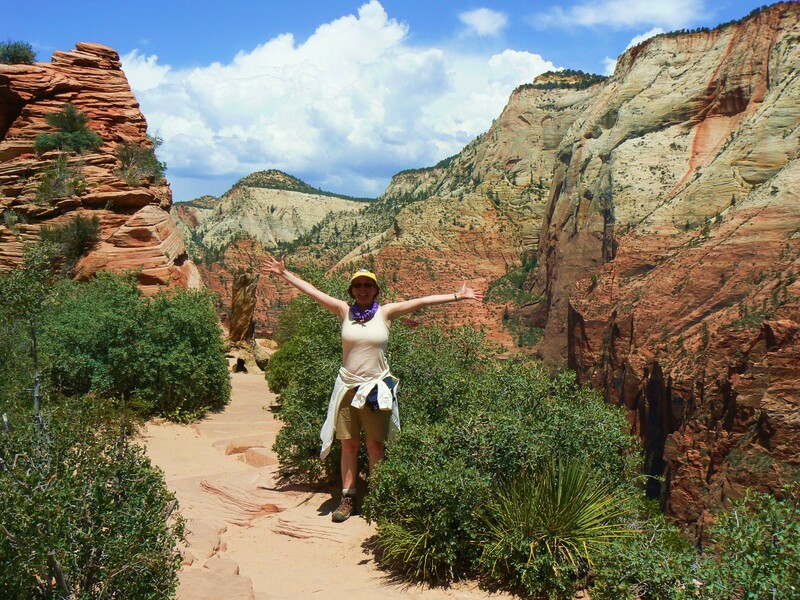 Here is a picture of me hiking in Zion National Park. Nature inspires me and demands my maturity every day. How are we to live in harmony on this planet with all other living and non-living things? Here is a picture of me with my children and my partner and other members of Team Galasso setting out on a walk to raise funds for the American Diabetes Association. My husband died almost 5 years ago from complications of diabetes, namely heart disease. The process of grieving his death and parenting our children drives much of the writing which finds its way into my blog. 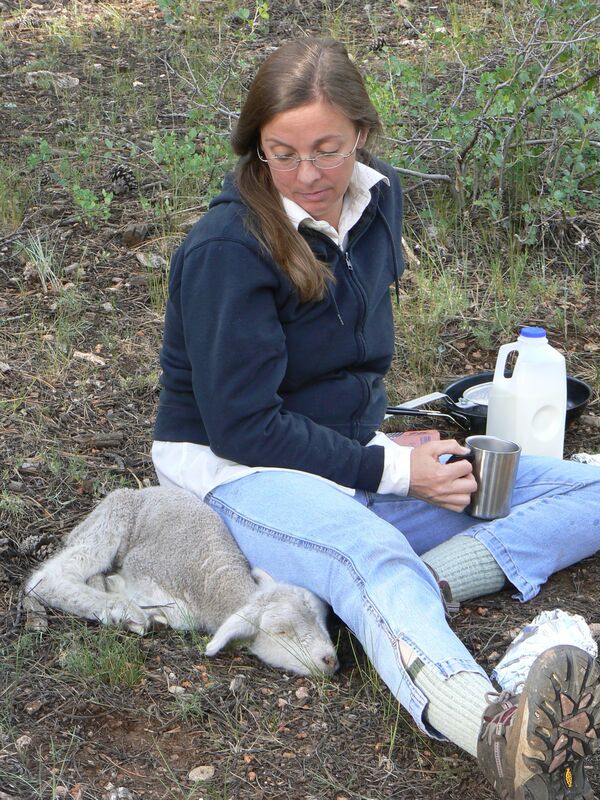 And finally, here is a picture of me beside a campfire with an abandoned lamb who is dying of starvation without its mother. It illustrates the compassion that inspires me to blog, to connect with humanity through words and photos, to face the reality of our common suffering without looking away, simply to be present in the world, aware, and alive. 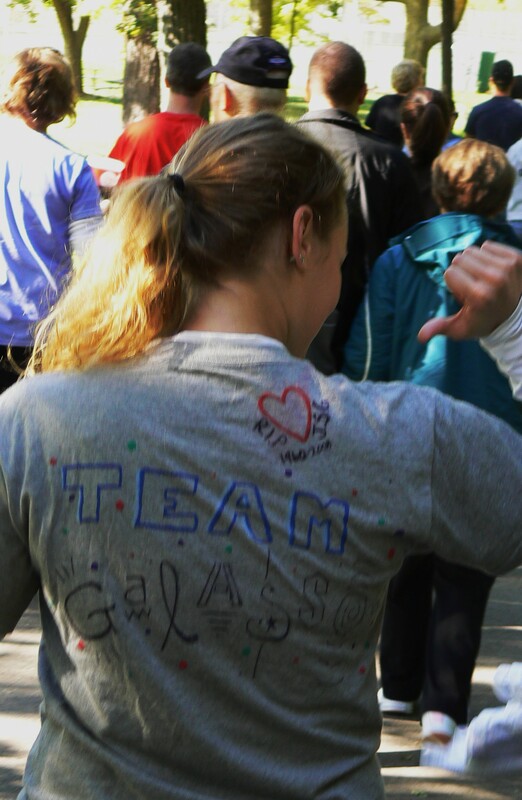 Team Galasso will be stepping out at a walkathon on Sunday to raise money for the American Diabetes Association, funding programs and research aimed at relieving the suffering of 26 million Americans with the disease. This is the fourth year that we have done this as a family, and this year, the event falls on the birthday of my husband, Jim, who died of diabetes-related coronary artery disease in 2008. This event gives us an opportunity to do something positive in the search for a cure as well as the occasion to gather as family and celebrate Jim’s birthday (and mine, last Tuesday!) and his life. I will be heading out to Madison after work tomorrow, bustle dress in the back seat, eager to meet up with the rest of the Midwest Galasso Women. My son, unfortunately, won’t be able to make it. If you would like to support us in this effort, please click here to make a donation. We’re heading out to a full-on Italian lunch after the walk. Happy Birthday to Jim! The world is gearing up for another Olympic Games. National pride, sportsmanship, individual performance, athleticism, courage, and victory will be concepts that will get much press in the near future, I suspect. I like to push out the boundaries of concepts and see how they all interconnect and create a bigger picture. In this arena, I’m going to put all of those issues under one large banner: humanity. The Olympics give us an opportunity to look at humanity, albeit through a particular lens, and witness ourselves. What do we have in common? What are the responses available to us in certain circumstances? How do role models give us a glimpse into the possibilities we carry in ourselves? When I was growing up in the 70s, I would glue myself to the TV and soak in all those “up close and personal” stories. I found them fascinating and inspiring. Now that I have lived to be (almost) 50, I have lived some stories of my own that have taught me about being human. One of those is the story of watching my husband die of diabetes. Human beings experience suffering; that’s one thing we all have in common. We can learn information and we can gain understanding and compassion by looking into that suffering and asking questions. What is causing this suffering? How does it feel? How can I help? The Galasso family looked into diabetes for the first time in 1991, when Jim was diagnosed. After he died in 2008, my oldest, Susan, came up with a way that we could help those who suffer from it. She organized the first Team Galasso and walked with 2 of her siblings in a fund-raiser event in Urbana, IL sponsored by the American Diabetes Association. The next year, she moved to Madison and Steve and I walked with her. 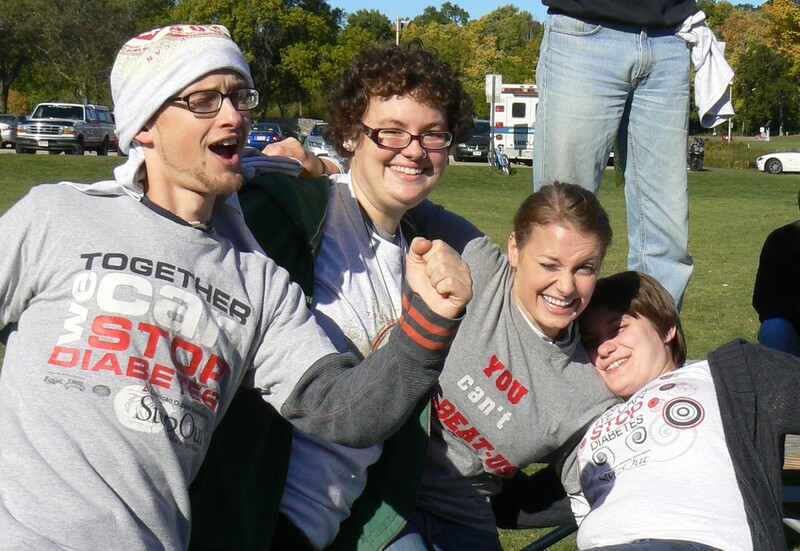 Last year, the entire family gathered in Madison (including Susan’s fiance, Andy) to continue the effort. This year, the walk is being held on Jim’s birthday, August 26. How fitting is that?! I invite you all to participate in this Team effort by making a donation to the ADA via my sponsor page here. I also invite you to spend some time considering your part in Team Humanity, asking your own questions about being human, about suffering, about living in a body. Who do you want to be? How do you want to live? What will your life model and inspire? My youngest daughter got her first tattoo a few months ago. She chose a typewriter font over her left shoulder, above her heart, to illustrate one of her dad’s most memorable maxims: “Pain is inevitable; misery is optional.” I am honored to be part of this team, this family of humanity. I want to acknowledge and include every member and recognize that each one is trying to work out the answers to those questions, even though there are destructive results in the process. I’ve had mine, you’ve had yours. We can learn and do better. I believe that. Thank you for your participation!